I used an old frame I picked up at a garage sale, mod podge, a piece of textured purple card stock for the background, some paper accents from a Halloween stack, black and green jumbo rick rack and my hot glue gun. I started by using the mod podge to glue the card stock to the glass, I’ve got a huge stack of picture frames from garage sales so I wasn’t worried about not being able to re use this one. The key to getting the shape right is paying attention to the ends, make sure they go the same way. 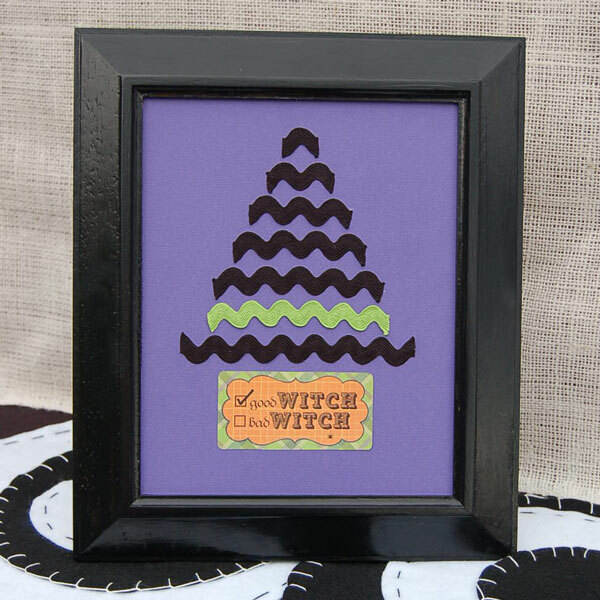 The little good witch/bad witch sign was cut off a piece of scrapbook paper and glued on. Took a long time to load, and once I realized I needed to click to continue to next page, the comment box did open. Creative Blogger friend. oh, yeah, the rick rack witches hat is really adorable! Super cute! Thank you for sharing at my Our Favorite Things Link Party. 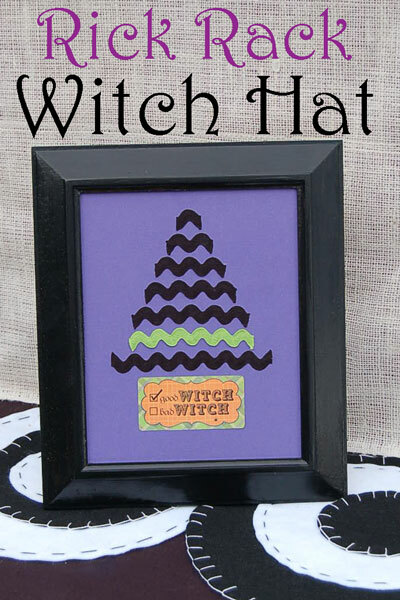 The witch hat is cute and clever. What a great idea! Why do I never come up with these things,lol. I think this would look cute on a little tee as well. Thank you for the great idea! So fun! Love rick rack ! Thanks so much for sharing! I’d love for you to visit my blog. Really cute art for Halloween. So cute, and totally going on the list of must makes for this week! What a great idea! I am all for cute Halloween decor. I am a big baby when it comes to scary stuff! This is so cute, and simple, too! Thanks!